Zachary Harvat is a PhD candidate in English with a graduate interdisciplinary specialization in sexuality studies. Broadly, he studies twentieth- and twenty-first-century American literature, queer theory/queer of color critique, LGBT literature and history, and video games. 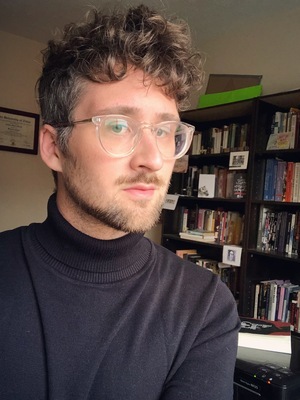 His dissertation examines how queer cultural production (literature, film, television, comics, video games) since the AIDS epidemic represents and engages with the past through formal and affective play, offering alternative frameworks for queer historical interaction not predicated solely on trauma or melancholia. Since 2014, he has worked with other graduate students to create video game studies courses in the English department and has collaborated with faculty across departments to build an interdisciplinary game studies minor at Ohio State. He has taught classes on American literature, queer studies, popular culture, film, video games and composition. Since May 2017 he has served as the editorial assistant for Poetics Today under Brian McHale.